Update: This offer is no longer available, please check the landing page for the current offer. Barclaycard released a increased offer on their relatively new co-branded American Airlines credit card—the AAdvantage Aviator Red World Elite MasterCard. Since it’s release in late 2016 the card has offered a 40,000 miles sign-up bonus after the first purchase within the first 90 days. Now you can earn 50,000 AA miles after the first purchase! The card does come with an $95 annual fee that is not waived the first year. Even with a $95 annual fee, it’s hard to complain when earning 50,000 miles after the first purchase. And although AA saver award space has become increasingly difficult to find, with enough planning it’s still possible to get value from AA miles. Now let’s take a closer look at what the card has to offer and the new sign-up bonus. 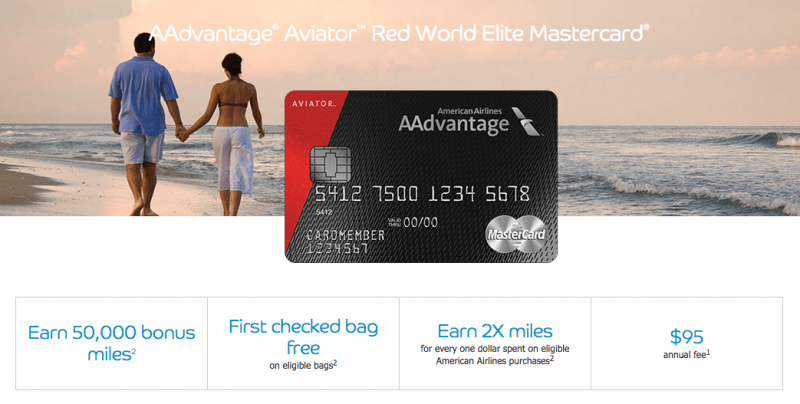 Barclaycard’s new sign-up bonus on the AAdvantage Aviator Red World Elite MasterCard is for 50,000 AAdvantage miles after the first purchase within the first 90 days. With no minimum spending requirement, this card will is an enticing option for anyone who finds it hard to meet high spending requirements. It’s also a perfect card to add into the mix during a round of credit card applications. The AAdvantage Aviator Red World Elite MasterCard comes with, more-or-less, your standard airline credit card benefits. Nothing too exciting to write home about, but some nice perks if you fly frequently on American Airlines. Earn 2X miles for every dollar spent on eligible American Airlines purchases. Earn 2X miles for every dollar spent on all other purchases. 25% inflight savings on food, beverages, and headsets on American Airlines-operated flights. 10% of your redeemed miles back (10,000 maximum per calendar year). The card does have a $95 annual fee, which is not waived the first year. On the other hand it does offer no foreign transactions fees, so it could be another possible card to take on international trips. Now you can earn 10,000 more miles over the past offer on the AAdvantage Aviator Red World Elite MasterCard. The new sign-up bonus is for 50,000 AA miles and it’s easy to earn—all you need to do is make a purchase in the first 90 days. The card does come with a $95 annual fee, which is not waived the first year. But even with that, it’s well worth it to grab this card with it’s low-hanging-fruit bonus offer. How long does it take after you’ve cancelled the card before you apply for the card again and get the bonus?